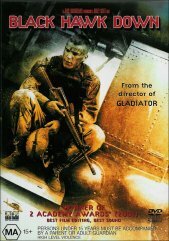 Based on true events, Black Hawk Down is the tale of the US Army Rangers and Delta Force soldier's attack to find a Warlord in Somalia who is withholding aid food from the starving in order to stay in power with his corrupt regime. Directed by Ridley Scott, Black Hawk is one hell of a ride that will keep you riveted from start to finish. I found this movie compelling viewing on many levels, not the least of which was the real life factor, which although most likely polished up from a patriotic viewpoint, saw these soldiers go to hell and back in under 24 hours. Cinematically the movie is a delight to behold and every scene represented looks fantastic. Special effect look absolutely realistic and there is no point that you question the events you are seeing. Australian Eric Bana puts on a powerhouse performance and I must confess that it took a while to get used to him using such a broad southern American accent. It is convincing and his character was excellently portrayed. Black Hawk Down is a must own DVD and stands proud amongst the current war movies on offer. The extras are interesting viewing and On the set of Black Hawk Down is very well done. The trailers for Spider-Man and The One look great and in particular the Spider-Man Trailer had me looking forward to that release.